Please see the numbered items, below. Item 1 is an email that I recently shared with several prominent geologists regarding the worldwide flood. Item 2 features two of Churchward’s paintings that depict the destruction of Mu; Item 3 is an annotated Google Earth map of the Monterey Canyon region off the coast of California; and Item 4 discusses Sedgwick’s recantation of his belief in a biblical flood, the scientific method, and geologists’ failure to reject a false paradigm in the presence of new data. Shortly after I moved to the Monterey, CA, area I came upon the relatively new Google Map (satellite view) data that reveal submerged, former river systems. Anyone but a geologist would know that this drainage system could only have been created by subaerial processes. Yet geologists believe that they were, and such bad science must be corrected: geologists are fitting the creation of these structures into their ‘no flood, ever’ paradigm (discussed in Item 1). Such explanations illustrate the practice of fitting observations to theory, which is anti-science; turbidity flows as the creation mechanism represent an ad hoc speculation crafted to eliminate apparent conflict with the prevailing paradigm. Not just that, but the explanations also exemplify the confusion of cause and effect – whatever turbidity flows that have been observed in/near these structures are post-submersion consequences and certainly not their creation mechanism. To consider that these submerged drainage systems were carved by subsurface processes finds its historical equivalent in the idea that all celestial bodies orbit Earth. To resolve matters I identify the cosmic impact that delivered the worldwide flood waters. While forever changing the planet, the vast and newly introduced waters also buried Mu and Atlantis. Remnants from each of these civilizations will eventually be discovered far beneath the ocean’s surface in places that have thus far been beyond our consideration. Although mentioned in Item 1, I wish to emphasize this important consequence: we humans are ill-adapted for the post-flood ecosystem that we encounter. The planet for which we are adapted no longer exists, and our survival necessitates exploiting and abusing Earth’s resources for warmth, shelter, and food. 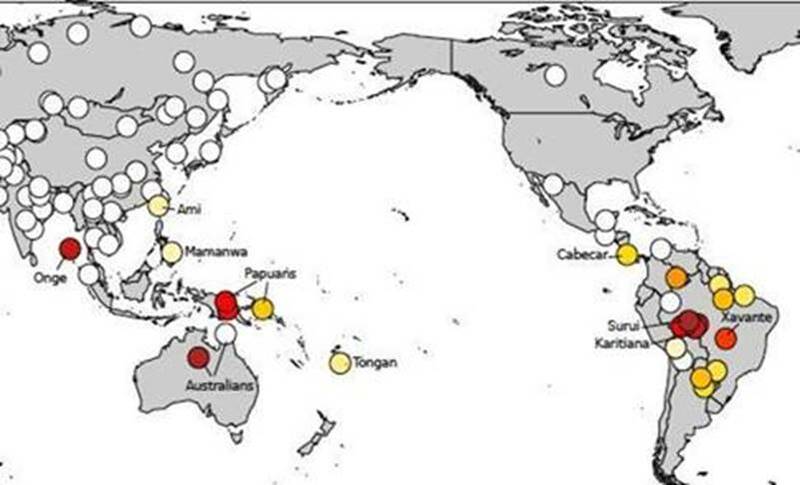 From an archaeological and anthropological perspective, humans did not occupy presently exposed landscapes (except in some locations at tropical latitudes) prior to the worldwide flood because, at more than two miles above the former sea level, the lands we occupy now would have been too cold. For those interested, I gave this presentation, “Resolving the Problem of Atlantis,” to the Explorers Club in NYC this past April. 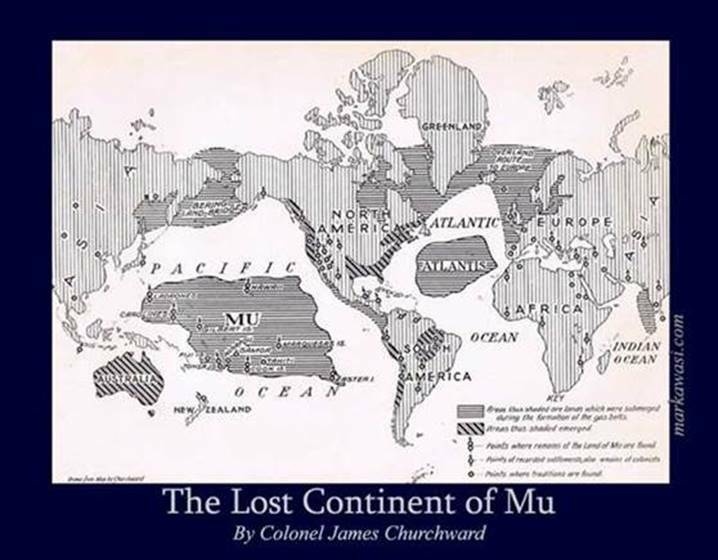 I hope that all this will help you and others to put into proper context COL James Churchward’s findings: Mu existed, and it was lost in the worldwide flood. As you are probably aware, for nearly 200 years geologists have accepted that the Earth has had all its water since nearly its beginning. This paradigm finds its origin in the early decades of the 1800s when Buckland, Sedgwick, Conybeare, Lyell, etc., began the process of determining whether or not the whole of the Earth suffered a deluge. It became apparent to all that diluvial gravels belonged to multiple, distinct events, and because there was not a common event in the record then there could not have been a worldwide flood (e.g. Sedgwick’s recantation, 1831). But this conclusion and its ensuing paradigm precluded the possibility that now-submerged landscapes might have been inundated by some unknown event. From the evidence the precise conclusion should have been: presently exposed landscapes were not inundated by a presumed worldwide flood. This is wholly different from claiming that there was never a worldwide flood. 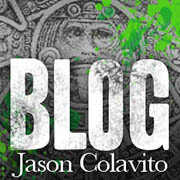 Yet “no global flood, ever” became the accepted paradigm that persists to this day, and it has far-reaching implications. Relatively new data in the form of Google Earth and Google Maps (satellite view) expose the erroneous paradigm. 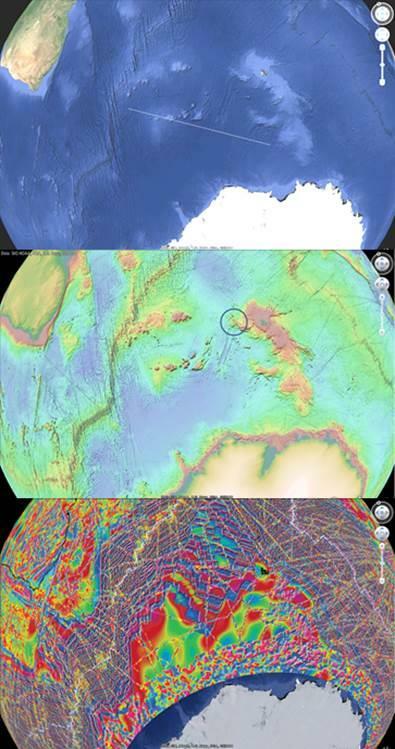 The map data reveal the remnants of a massive cosmic impact in what is now the Southern Ocean. (Location of impact is corroborated by this article.) The impacting object had a dense, solid core that was surrounded by a fragile outer layer. Assumed to have formed in the Oort Cloud, this outer layer would be consistent with known comet composition – predominantly ice – and upon melting it would deliver more than 3 km of water to former oceans and seas. This impact created the YD nanodiamond layer and associated environmental effects placing the event 13kybp. 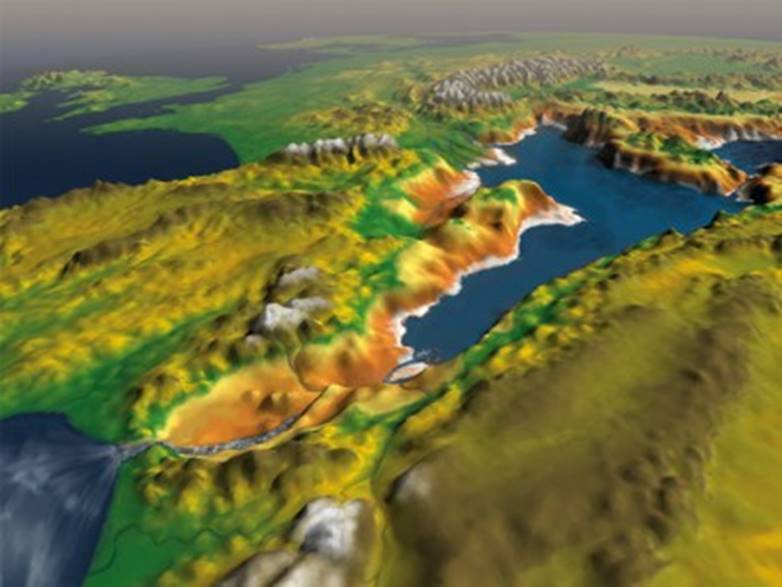 The flood waters submerged and preserved Monterey Canyon and similar drainage systems found throughout the planet. Humans commemorate the event in ubiquitous oral traditions: there was a catastrophic, worldwide flood. Here are three Google Maps views of the impact site. 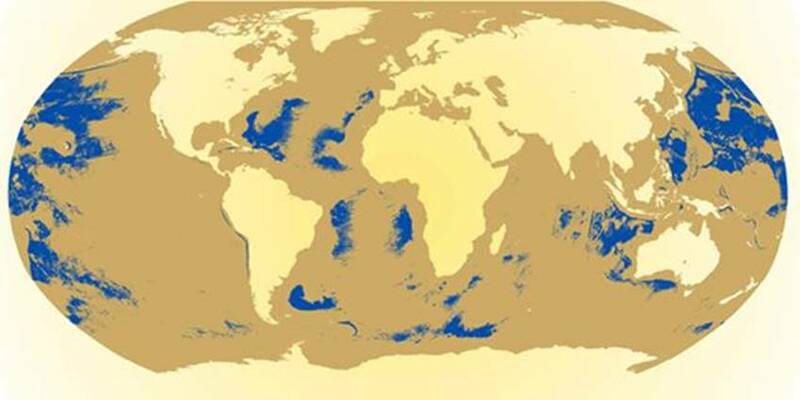 It is in the Southern Ocean southeast of South Africa and nearly due south of Madagascar. Center impact is vic 56.83S, 53.75E. These are identical perspectives of the impact site available to everyone with a computer and Google Earth. The upper is the standard view with superimposed diameter measuring 2500 km; the middle is a bathymetry map depicting raised regions of deposits borne by the impacting object – the circle identifies the location of the nucleus remnants (RGB color scale corresponds to highest to lowest elevations); the lower view is a magnetic anomaly map (RGB scale corresponds with most to least intense susceptibilities). Magnetic anomalies extend 1500 km to the northeast through the impact crescent’s gap – impact velocities and associated forces projected ice and other object-borne materials through the crescent gap. We note that the maps constitute data that had not been available to geologists or other scientists until recently. In the Oort Cloud where this object formed, gravitational accelerations induced by the solid, inner core were less than 1% of Earth’s. Aggregations forming the outer water-ice and debris shell made it more massive than the core, yet accelerations created by the combined system were on the order of 2% of Earth’s. These small accelerations explain why the impacting object was so loosely packed, porous, and fragile, as well as why its impact effects on the Earth are so unimpressive and far less damaging than what might be expected from a similarly sized but solid object. The object that struck in what is now the Southern Ocean created the nanodiamond layer, it caused the YD climate changes, and it flooded the planet by adding more than 3 km to former ocean depths. To anyone but a trained geologist the noticeable, meandering features are submerged river drainage systems. Yet one of the four is published by geologists as having drainages that were subaerially carved, and it is the one in the upper right (western Med) – Garcia-Castellanos (Nature, 2009) claimed that the Med flooded through the Strait of Gibraltar (their timing is way off, however). We note that the former drainages in the Med end at a common depth because carving/erosion is a subaerial process that ceases upon contact with a terminal body of water. Like those in the Med, the drainages in the other three examples were also subaerially carved and seeking their terminal bodies of water. They are preserved because they were quickly submerged by the flood waters. Here is a schematic from the Nature paper that depicts the waters beginning to enter the Med. 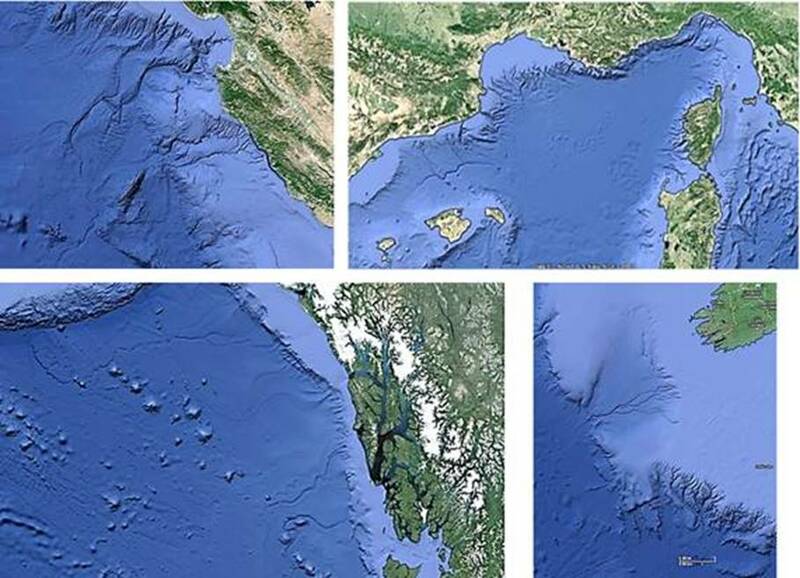 Note the there was a body of water in the Med and that for millions of years the waters drained into it thereby carving the features that are now preserved in the bathymetry and which we can now “see” via Google Earth/Maps. Submarine geomorphologists (and other geologists) conjecture that turbidity flows carved these submerged drainages because to them there was never a worldwide flood. But it is an absolute, physical impossibility for any flow to remain focused and energetic at the depths and distances involved to carve these structures. Geologists are fitting data to theory, and that is the practice of anti-science, or fantasy. Also, ascribing the structures’ creation to subsurface flows is the confusion of cause and effect: whatever turbidity flows that have been observed near these structures are consequences of the structures, post submersion, and certainly not their creation mechanism. To think that subsurface processes carved these features is equivalent to believing that all celestial bodies orbit the Earth. COL James Churchward’s work (e.g. 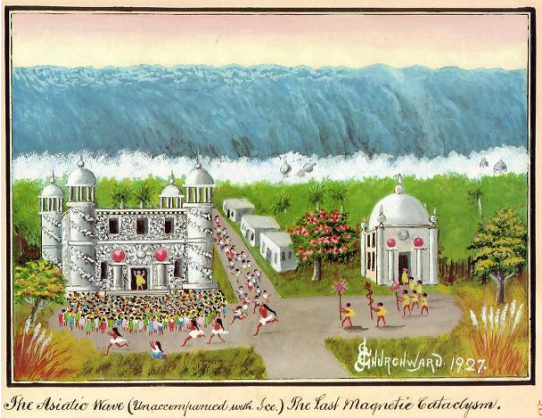 The Lost Continent of Mu) is discredited because of the “no flood, ever” paradigm. Nonetheless, here is a map he created roughly 100 years ago based on his travels and research. Note the location of Mu. Note the formerly exposed region to the west of South America, particularly its western extent, in the GIS-model, and compare it to Churchward’s Mu. The columns are remnants of human activity from Churchward’s lost continent, Mu. In addition, if you are familiar with Dillehay’s Monte Verde, then you would know that he conclusively places humans in South America between 12,400 and 12,800 years before present. Also, the Haida (noted seafarers) have been dated as far back as 13,000 years ago. Each settlement’s time estimate corresponds with the YD nanodiamond layer creation and the associated climate effects that were caused by the cosmic impact in the Southern Ocean that delivered the worldwide flood. Humans evolved in the former abyss where, in the absence of more than 3 km water, atmospheric pressures would have increased temperatures – it is why we are furless. Correspondingly, our furry relatives evolved in landscapes that were more than 3 km above the former sea level – it was much, much cooler up here (prior to the flood), and we encounter them now because we survived into available landscapes. Most important is this implication: we humans are not properly adapted for the post-flood Earth environment that we encounter. Hence our problems…. It is only a matter of time until other evidence of human activity is discovered in the deep abyss. 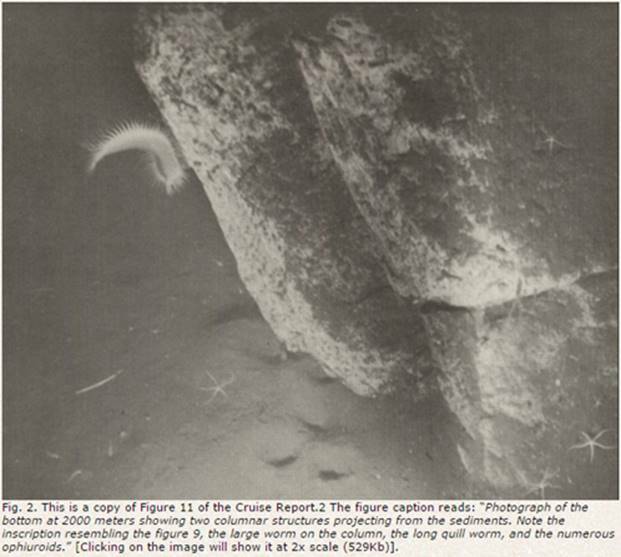 At that time what will geologists do (other than try to discredit the findings)? But the bottom line is this: geologists are preventing us from achieving a correct understanding of Earth and human history, and the community of scientists needs to be made aware of geology’s nearly 200-year old, fundamental, paradigmatic “no flood, ever” error. It will one day be recognized as the most profound error in the history of science. 2. 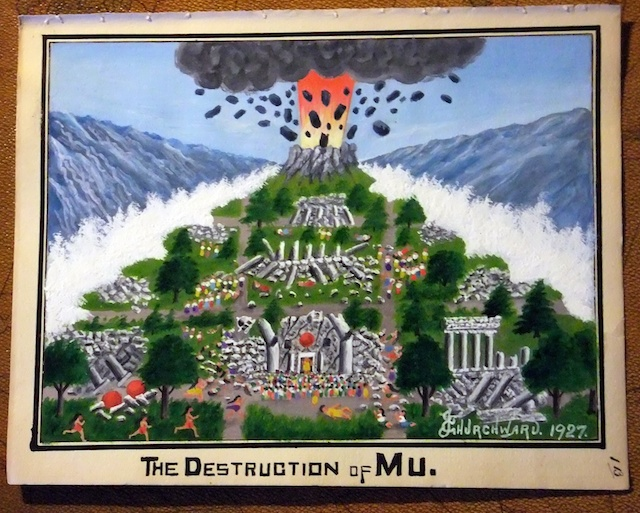 Two of James Churchward’s paintings depicting the destruction of Mu are shown below. Note that a portion of the upper painting’s caption reads, “…Unaccompanied with Ice.” I find that caption to be fascinating. The celestial object that delivered the flood waters was composed mostly of ice, and not all of it would have melted immediately after impact. Because Mu was located relatively close to the impact site, it is very reasonable to consider that the meltwaters would have carried substantial amounts of ice with them as they coursed about. So how did Churchward know this? He was hamstrung by Geology’s “no flood, ever” paradigm (in fact, he postulated that the entire continent of Mu had subsided into the abyss), so he would not have considered that the waters had a frozen, cosmic source, and this piques our curiosity: what prompted him to mention ice? Where would he have found the account? Would it be available today? Finally, it is worth noting that the lower image shows volcanic activity, another very likely and immediate consequence of the cosmic impact. 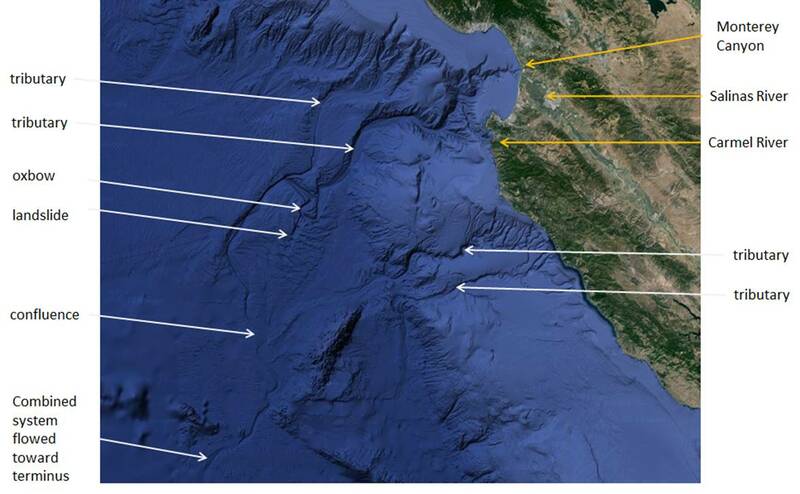 The confluence region in the Monterey Canyon figure is ambiguous or smeared as a consequence of river borne sediments being deposited into rising ocean waters much like the formation of river deltas. This accounts for the nature of a U.S. Geological Survey sample core drilled in this confluence region: it is primarily composed of terrigenous sand, and its secondary composition is terrigenous gravel deposits. Other river-borne materials that were deposited into the rising ocean waters account for the region’s sediment-filled channels. 4. The Rev. Adam Sedgwick was the president of the Geological Society of London in the early part of the 19th century, and he took part in and presided over the debate regarding whether or not there was ever a worldwide flood. At its essence, the argument against the worldwide flood went like this: because there was no common event found in diluvial records, then there never could have been a worldwide flood. But this conclusion is incorrect; instead, it should have been: presently exposed landscapes were not inundated by a presumed worldwide flood. This is the only conclusion that could have been drawn from the evidence, and it is precise, correct, and completely different from what the geologists determined. "…the vast masses of diluvial gravel … do not belong to one violent and transitory period. It was indeed a most unwarranted conclusion when we assumed the contemporaneity of all the superficial gravel on the earth…. Having been myself a believer [in a worldwide flood], and, to the best of my power, a propagator of what I now regard as a philosophic heresy … I think it right thus publicly to read my recantation." Sedgwick’s recantation came at the end of his tenure as society president, and, because of his stature not only as the president but also as a preacher, the incorrect conclusion became a paradigm that persists to this day. However, somewhat recent discoveries regarding the distribution of certain species of flora and fauna cannot be explained under the mistaken paradigm (see Part II of Cataclysm! by DS Allan and JB Delair). Then the map data reveal other facts and observations that also cannot be explained (at least not rationally). In addition, this new map data reveal the cosmic impact that could not have been known until recently. Coupled with our understanding of comet composition (e.g. NASA’s Deep Impact mission to comet Tempel 1), we can now couple historical accounts of a worldwide flood with its evidence. Unfortunately, geologists refuse to recognize the new data and its implications. Imagine being an editor or reviewer at some prestigious journal, someone with a long and lettered history among his/her profession, and being confronted with evidence that overturns a foundational belief in his/her field…. They should know that the scientific method calls for discarding their theories given the introduction of data that render it incommensurate and obsolete. And the “no flood, ever” paradigm is obsolete. There was a worldwide flood, and its cosmic source added more than 3km water to the Earth ecosystem 13kybp. It forever changed the planet.